The Exerpeutic LX9 Training Cycle is a spin bike that comes with features you don’t normally seen in its’ price range – it includes a console, fully adjustable handlebars and seat and elbow pads. This certainly makes it worth serious consideration as a spin bike for home use. In our review we look at all the important aspects of the bike to see if it makes the grade as a spin bike qualified to be used in the home for beginners and beyond. resistance and chain drive. All the things needed for a quality spin bike. This all makes it look like it has the ability to provide the basis for quality spinning workouts or indoor cycle training for fitness or for training when you can’t get outside on your road bike because of the weather conditions. The first step is to determine how stable it is when you are working out on it regularly and how it durable it is over a number of years. Despite its compact size at 20 by 31 by 47 inches it is a stable bike and stay firm whatever exercising you are doing – in or out of the saddle and moving in between. It is constructed from steel and there is no flexing or wobbling. The seat and handlebars do need to be tightened up fully to prevent them shaking. The flywheel at 40 lbs provides sufficient inertia to pull the pedals through the cycle motion to give a fluid riding motion which provides a low impact cardio workout that is easy on the joints especially the knees. To prevent it rocking on an uneven surface there are levelers under the stabilizer bars that you turn to level the bike out. It does appear it will hold up to frequent use over a number of years for beginners and intermediate users from customer reviews. The Exerpeutic LX9 Training Cycle can be adjusted to fit between the heights of 5 ft 2 ins and 6 ft 6 ins giving it a good range to be used by most people in a home. It only takes seconds to adjust the bike to your settings after you’ve set it up the first time. The seat and handlebars adjust vertically and horizontally. For the vertical adjustment you have 2 knobs – a pull-pin knob and lock knob. You loosen them and move the pole into place and the pin on the pull-pin knob is inserted into a pre-set hole you then tighten both knobs up. This can mean that the adjustment is either slightly too high or too low for you but should be fine for most people to get the bike adjusted correctly for their height. The horizontal adjustment is similar except you only have one knob and can move the pole slider to exactly where you want and don’t have to align it up with a pre-drilled hole. This helps to get the bike to just how you want it for the most comfortable ride. The elbow pads on the handlebars can be moved sideways in the same manner to get them to exactly where you want them. There are instructions on this in the manual but it doesn’t let you know where you adjust the seat and handlebars to for the best position for working out. Fortunately this information is readily available on YouTube. The resistance for hill climb type routines is provided by a pad that sits at the top of the flywheel. To increase the resistance you turn the tension knob at the top of the frame which pushes the pad down harder on to the flywheel. It is a single pad that provides a steady and constant pressure on the flywheel so there is no slipping or catching. You may find that adjusting resistance is a little sensitive as you don’t need to turn it that much for the resistance to change markedly. It takes a little getting used to but it does go up incrementally so you can adjust it to how hard you want it to. As with most spin bikes there are no markings to let you know how far you’ve adjusted the resistance to. This can make it difficult to adjust the resistance back to a previous level. To stop the flywheel quickly you press down on the tension knob and the resistance pad works as brake. This stops the pedals too. There isn’t a guard over the resistance pad to prevent sweat dropping on it or the flywheel. The salt and water in the sweat can damage the pad resulting in it needing it to be replaced more frequently. Having said that you should get about 12 months usage before it needs replacing. This is similar to most bikes in this price range and the bikes that do have a guard like the Spinner S1 don’t come with a console. You can get replacement pads from the supplier and their details are included in the owners guide. The bike has a chain drive which helps to give the bike a feel of riding a road bike. It makes a similar amount of noise too when properly adjusted. It’s not that loud but it isn’t silent. You should be able to cycle without disturbing others in another room. If you do want a quieter bike you should consider a belt drive bike like the Sunny Health & Fitness Belt Drive Indoor Cycle bike although this doesn’t include a computer. There is also less ongoing maintenance with a belt drive and it is a smoother ride but you do lose the feel of riding a bike outdoors because of this. There is maintenance required for this chain drive which can all be done by the owner. It involves tightening the chain and lubricating it as needed. It takes a few minutes and needs to be done infrequently. It is less than that required on an outdoor bike as you aren’t going over bumps or kicking up dust and water on to it. There is a guard that encloses the chain that prevent sweat dropping on to it and damaging the chain helping to keep it in good working order for longer. The guard also stops your ankles or clothes getting caught up in it. It is a direct drive or fixed gear which allows you to pedal backwards as well as forwards, although you do need to check the pedals don’t come loose after pedaling backwards. As the drive is a fixed gear the pedals turn when the flywheel is turning which means when you stop pedaling the pedals will continue to turn. To stop the pedals you are required to either carefully slow the pedals with your feet or use the emergency brake. This will help to prevent injury when you want to get off the bike. If you haven’t used a spin bike before this can take a little getting used to. 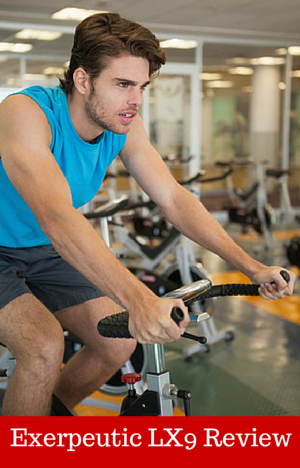 It is a common feature of indoor cycles and spin bikes. The pedals are made of an aluminum alloy that screw into a solid crank system so you can stand on the pedals without any sideways movement or flexing giving you the confidence to increase the intensity to the level you want. The pedals have toe cages and straps that fit athletic shoes. Once you’ve slipped your shoes into the cage you tighten up the straps to give you a good solid grip on the pedals so they stay anchored on them no matter the speed you are pedaling at. The pedals do not take specialist shoes but you can replace them with pedals that do if oyu want as the crank uses a standard bike thread. Noise The bike is fairly quiet but not silent. For most people the noise is going to be acceptable. You’ll hear a low clinking sound from the bike and soft rubbing sound from the resistance pad. You may need to turn the TV up a little to hear it clearly. Anyone sitting in another room is not likely to be disturbed. If you want a quieter bike you are going to need to look for one with a belt drive and magnetic resistance. These do cost more with the Ironman H-Class 520 Indoor Training Cycle being about $350 more. It includes a console that you can use with their fitness App and account to monitor, track and analyse your performance. It doesn’t come with elbow pads for the aero position training. There is also less maintenance and dirt from the bike. Dust and Dirt There isn’t too much dust and dirt given off by the bike but there is some. The resistance pad will give off dust as it wears down and the moving parts will drop a little lubricant. You may also drop sweat on to the bike and the floor. The bike does need a quick wipe to keep it looking good and to prevent rust. Your floor may get damaged if any of this drops on it so it is a good idea to put the bike on a rubber mat. Seat The seat is a cushioned seat which is similar to ones you find on outdoor bikes. You may still find it too hard for your liking and this is normal for bike seats. You can replace the seat with one you prefer as it takes standard bike fitting seat. You can also try padded bike shorts or a gel seat cover to get a more comfortable experience. Handlebars The handlebars come with elbow pads that can be adjusted so they fit your style and size. These will be a big help when you are in the aero position and aren’t common on spin bikes at this price range. The ends of the handlebars are coated to make them easier to grip but the crossbar isn’t which will make it difficult to grip when your hands are wet. As well as the aero position you can place your hand in the standard spinning positions in the center, shoulder width apart and at the end of the bars (where the hand pulse sensors are). This is a compact bike that only needs an area 20 ins by 31 ins when being stored so it could fit under the stairs or in a large cupboard. To help in moving the bike to and from and storage it has 2 small wheels on the front stabilizer bars that you tip the bike on to. The wheels hold the weight of the bike leaving you to navigate the bike to where you want it to go. The wheels shouldn’t jam on carpet as they are fully exposed. If you are moving on a wood floor you may want to be sure they won’t scratch or dent it before you wheel it along it. There is some assembly required when you receive the bike. It does come mostly assembled and the time to complete is less than an hour. It is a straightforward process and is described well in the owner’s manual. The tools needed to complete the job are included. You need to add the stabilizer bars, seat, handlebars, adjustment poles, console, pedals and water bottle holder. The most difficult part of the task is to be holding the partially assembled bike in place while attaching the stabilizer bars. To do this it is a good idea to have some help to hold the bike steady to ensure you don’t damage the bike or injure yourself. The bike weighs 112 lbs when fully assembled. The console measures RPM, time elapsed, speed, calories, heart rate and recovery rate. You can set targets for time, calories and heart rate or just let the computer show the latest count or position. When exceed the heart rate target the computer will beep. It beeps also when you hit a pre-set number such as distance etc. The display shows all the values at once so you can see where you are up to. There a 4 buttons below the display for setting the targets and resetting the computer. The calories is an estimate only rather than actual calories burned. To get a heart rate reading you need to gripping the heart rate sensors. They are at the end of the handlebars where you would normally grip when out of the saddle to give you more leverage when pushing hard. It is good these are included but it does restrict your hand positions when you are riding if your are wanting to stay in your training zone. I feel a chest strap is a better solution for getting constant feedback and you can put your hand where you like. Still this is much better than you get on most spin bikes. The recovery measure is used when you finished your workout to determine how long it takes you heart rate to return to resting rate. There is a rating from F1 to F6, but the manual is a little lacking in detail as to what this means. I have asked manufacturer several questions and I am waiting on a response on this. After 4 minutes of no pedaling the computer goes into power save mode. It does save all pre-set and exercise values giving you chance to get off the bike, return to it and re-start where you left off. The numbers are easy to read in good light but it doesn’t come with a backlight which makes them harder to see when light is a little dim. It uses to 2 AAA batteries to power it. It does not let you know when you need to replace them. You can’t upload the information to your computer or fitness account so you’ll need to record this information manually if you want to track your training and workouts. The manual does contain a warning to keep the console free of sweat and moisture to prevent these from damaging it. You would think it would be water resistance at least considering what it is going to be used for. The bike does not come with much in the way of accessories. This is normal with spin bikes and in particular in this price range. There is a water bottle holder that is on the right fork which can be reached easily as you pedal but is not as convenient as those bikes that have bottle holder in the handlebars. You do need to slide the bottle in and out of the holder which does mean you need to look when putting it back. It also has elbow pads which are great for saving the forearms from getting hurt when you are in the aero position leaning on the aero bars (inner handlebars). This is a great feature of the bike especially if you intend to use it for indoor training as part of your regular program or can’t get outside due to the weather. The owners guide does have guidance on how to adjust the bike but not where you should set them to. It gives you warm up exercises to do before you start your workout but there is no guidance on what to do as a workout. It has transport wheels for moving to and from storage etc. The reviews for the bike are mixed. The negative reviews are mostly about the problems with shipping. Where they have been about follow up issues the company is working with the customer to resolve the issue. Those that haven’t had delivery issues like the fact that it feels like riding an outdoor bike. They also mention how easy it is to assemble and adjust. They are pleased with the bike and their workouts. For the price you get some great features that not all bikes in price range have. You get elbow pads, 40 lb flywheel, console and fully adjustable seat and handlebars, making it well priced and good value for money. Amazon do discount this bike from time to time with free shipping. It is a well put together bike (aside from the packaging) that is a good starter bike or for those at intermediate level. It comes with a good basic console which gives you information to keep you motivated and on track as you workout. The elbow pads are a great addition as are the aero bars for those that want to use it for indoor training when they can’t get outside because of the weather. The riding experience is smooth and similar to that of an outdoor bike.